Progress forward in voting the Republican Party out of existence. A progressive Democratic victory. Democrats and progressive young independents awoke and made political history in Florida’s Governor election of their first black Governor. The Blue Wave is rising, so don’t think voting doesn’t work! And then you’ll want to sign up to host or co-host a local “Wave” voter contact event for fellow MoveOn members in your congressional district, which has one of the top competitive Congressional races in the country that could decide if together we end GOP control of Congress. 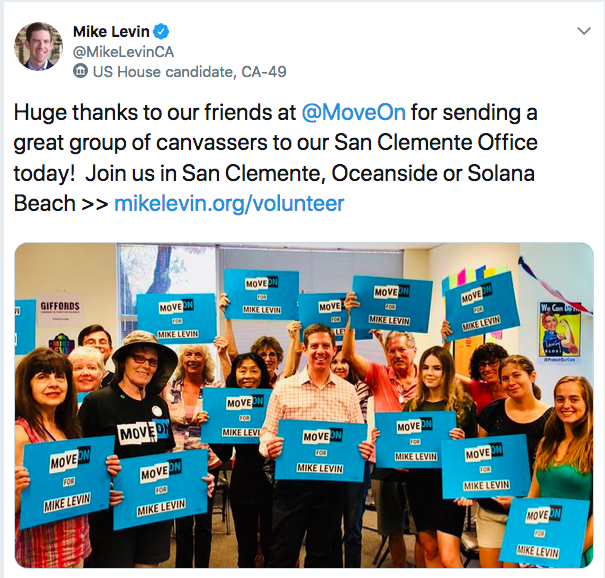 Now here’s Mike Levin, MoveOn-endorsed candidate for Congress in California’s 49th District, shouting out the MoveOn members who joined Matt H. and came out Sunday. Their volunteering in this highly competitive seat could mean the difference between GOP or Democratic control of the House. When we gathered, on September 8, 2018, before entering the campaign office site of our MoveOn-endorsed candidate, Sean Casten, we talked and understood that our main goal is to flip the House in Illinois Congressional District 6 in the 2018 midterm election. We need an agenda, in Washington, that works for all people, and we will be on the front line, canvassing and phone banking, as we prepare for November 6. James, you live in a congressional district, MI_06, with a competitive House race. And so far, there’s no Wave voter contact event for MoveOn members in your district to get involved in. Are you that somebody to kick things off? Click here to learn more about hosting a Wave event in your district, and sign up to host! You can also click here to RSVP for the Wave Host Interest Call next Thursday, September 20, to get more information and meet other Wave hosts in competitive districts around the country. 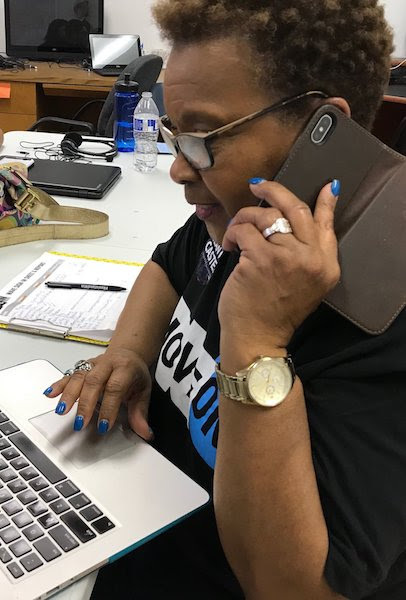 Last weekend, there were 37 events from coast to coast, with hundreds of volunteers having conversations with thousands of voters. And that’s just the beginning. In a few weeks, September 29-October 3, we’re setting our sights on 100 events across dozens of Congressional districts, including yours. MoveOn members across the country will be focusing attention on the theme “Families Belong Together” because we cannot allow Trump to continue unchecked by his own party on his horrifying policies of family separation. We must elect new leaders who know we elected them on a platform of keeping families together and just immigration reform. 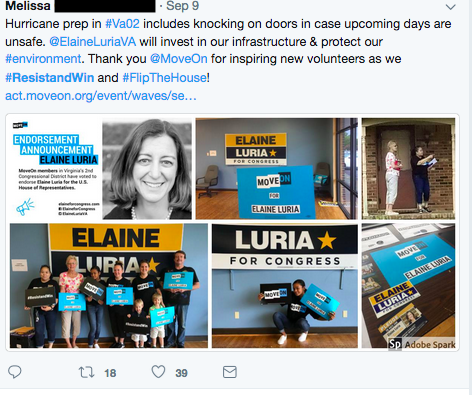 Can you take the first step and sign up to host a MoveOn Wave voter contact event the week of Saturday, September 29 to Wednesday, October 3 in MI_06? We’ll support you every step of the way and make sure you have everything you need to succeed. You’ll be joining an amazing community of volunteers like Melissa, Matt, and Evelyn. Yes, I’m in. I’ll host a Wave voter contact event for fellow MoveOn members later this month or in October. I’m not sure yet—but I’ll join the Wave Host Interest Call next Thursday, September 20, to get more info. With 54 days until Election Day, this is our time. P.S. 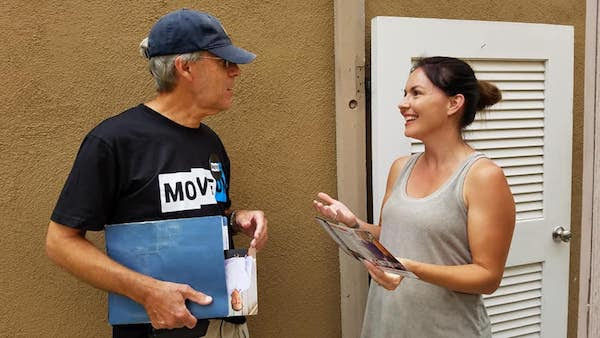 If Evelyn, Matt, and Melissa’s stories weren’t enough to warm your heart, here’s my dad, Ron, his first time ever knocking doors, talking with an undecided voter about the House race in her district that has long been held by Republican Dana Rohrabacher and is competitive for the first time in 30 years. She’s thinking about her two young kids in this election, and I think it was especially meaningful for her that my dad and I were out there together. She was even interested in volunteering, too! Will you be part of the winning agenda and host a voter contact event in your congressional district, or join the Wave Host Interest Call next Thursday, September 20, to get more info? MoveOn needs your help, now more than ever. A senior member of Donald Trump’s own administration wrote in an op-ed that Trump is “amoral,” “petty,” “reckless,” and “erratic.” The author even admitted that the Cabinet considered invoking the 25th Amendment to have him removed—but they didn’t, and they won’t. The only way to stop Trump is if we use our people power to fight back at the ballot box and fight for a country that works for all of us. MoveOn is ready to fight. Will you stand with us? PAID FOR BY MOVEON.ORG POLITICAL ACTION, https://pol.moveon.org/. Not authorized by any candidate or candidate’s committee. Last night, progressive Andrew Gillum did what many thought was impossible: He won the Democratic primary for governor of Florida! He is a bold, powerful voice for change with a real chance to turn Florida blue—and Republicans are running scared. Which is why, less than 24 hours after his victory, the vicious attacks from the right have already begun. Let’s be very clear: These types of attacks should have no place in our politics or our society today. And the best rebuke to these down-in-the-gutter tactics? Electing incredible leaders like Andrew Gillum and showing Trump and his allies the power of the Resistance. Click here right now to chip in $3 to Andrew’s campaign and help elect the first Black governor of Florida. 100% of your donation will go to his campaign. Andrew is the mayor of Tallahassee, where he worked to develop a thriving and fair economy, took on the gun lobby and won, and stood up to President Trump and right-wing Governor Rick Scott to defend immigrant communities. He ran an unapologetic, progressive campaign in Florida—shocking a lot of people who wrote him off in his primary. But that bruising primary win has left his campaign with little money at a time when GOP megadonors such as the Koch brothers are going to spend millions to tear him down. This morning’s attacks make one thing very clear: Republicans are so terrified of the blue wave headed their way this November that they are willing to engage in gutter tactics. Will you join me right now and chip in $3 to his campaign to help Andrew fight back and win? P.S. This race matters. To all of us. Will you join me right now and chip in $3 to help elect Andrew Gillum the first Black governor of Florida? PAID FOR BY MOVEON.ORG POLITICAL ACTION, https://pol.moveon.org/. Not authorized by any candidate or candidate’s committee. Federal candidates or officeholders mentioned above are not asking for more than $5,000 per calendar year from individuals or other federally permissible sources, nor are they asking for any funds from corporations, labor unions, or any other federally prohibited sources.